A cord here, a cable there. After you build your new height adjustable standing desk and hook up all of your devices, an unintended consequence might be a tangle of cables around and behind your desk. Don't let this be you! A properly organized desktop can help you work better and reach a higher quality of work thanks to Wire Grommets from UPLIFT Desk. Wire grommets allow you to achieve ideal wire management by providing you with a centralized hub to thread your cords and cables through. These grommets are installed at the rear of your new standing desk, and come with a cover that opens and closes for a clean and copacetic look for your workspace. Match your wire grommets with your accessories or desk frame for a desk that screams your style. With black, white, and gray color options to choose from, you’ll be able to have the complete desk setup that inspires, uplifts you, and routes your wires. Want to upgrade to in-desk power options? 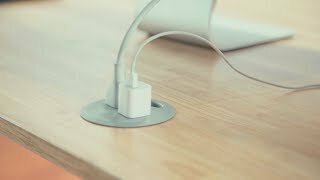 The UPLIFT Desk Power Grommet adds two in-desk power outlets to each grommet hole for a more productive workstation. How do I know if my desktop grommet holes are compatible with these wire grommets? UPLIFT Desk Wire Grommets are meant to fit into the grommet holes that are pre-drilled into most of our desktops. Some desktops, such as the Reclaimed Wood Desktops, do not have grommet holes pre-drilled because they would alter the integrity of the desktop. Can I add these to my desktop? If your desktop did not come with grommet holes you will need to purchase a new desktop with pre-drilled grommet holes or drill the holes yourself. Please note that grommet holes should not be bored into our Reclaimed Wood Desktop as they will disrupt the integrity of the desktop. What size grommet holes will these fit into? The UPLIFT Desk Wire Grommets fit into grommet holes that are 80mm in diameter. What is the purpose of a wire grommet? The Wire Grommet allows you to route your wires through an opening in the desktop. This is a great way to keep your wires organized instead of having them all hang off the back of your desk in a disorganized fashion. Do I need these on my desk? If your UPLIFT Desk has grommet holes, then you would benefit by getting UPLIFT Desk Wire Grommets. These Wire Grommets provide a nice finishing touch as opposed to just having an open grommet hole. Are these different than the wire grommets that came with my UPLIFT Desk? No, these are the same wire grommets that came with your UPLIFT Desk. The only difference is that we now offer them in black, gray, or white. Wire Grommets by UPLIFT Desk are now available in your choice of black, gray, or white. Choose the color that matches your UPLIFT Desk Frame or complements your desktop. Each grommet has a small opening through which you can route your wires for a streamlined cable management system. The cover can be closed when not in use. $7.00 List Price: $15.00* The list price is the same as the MSRP (Manufacturer's Suggested Retail Price). It may not necessarily be the price at which the product is sold.